A Pioneer Pedaling Monitor System is my newest cycling gadget for the 2016 season. I’ve purchased a Pioneer Dura Ace 9000 Single Leg Power Meter model SGY-PM910HL and combined it with the Pioneer SGX-CA500 cycle computer (and thus Pioneer Cyclo Sphere – Analysis Software). This Pioneer Pedaling Monitor System provides rich measurement of force and force-direction every 30 degrees (12 times per revolution) and calculates the HDpower metrics like pedaling efficiency. I can upgrade to a dual leg power meter system at a later point in time to match the professional cycling teams Giant Alpecin and Lotto Jumbo. In the article I will describe the different components and briefly share my initial thoughts on each of them. I’ll probably write some more in depth articles on one or more of the components. The Pioneer Pedaling Monitor System is a well integrated set of different components. The K-EDGE Handlebar Computer Mount for Pioneer SGX-CA500 and Wahoo Tickr X Heart Rate Sensor are my own preferred computer mount and heart rate strap. The Pioneer SGY-PM910HL Dura Ace 9000 Single Leg Power Meter is simply a standard Dura Ace 9000 left crank with a Pioneer strain-gauge based power-meter attached to it. 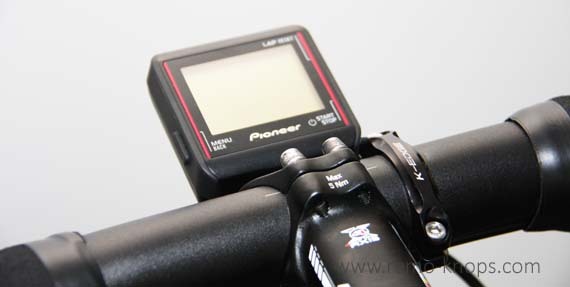 Pioneer doesn’t use branding on the crank-arm and the design seems very similar to the Stages power meters. Personally I like the fact that Pioneer doesn’t use branding on the crank, and that keeps the look and feel of my Canyon Ultimate CF SLX clean. The Pioneer SGY-PM910HL Single Leg Power Meter connects to every ANT+ cycle computer, like for example the Garmin Edge 520. It works flawlessly, but doesn’t give you the HDPower metrics like pedaling efficiency. So if you opt for a Pioneer power meter go for the Pioneer SGX-CA500 Cycle Computer as well. You don’t have to be a professional mechanic to install the Pioneer SGY-PM910HL single leg power meter. It is simply a matter of changing the left crank-arm. Only thing to you need to look into is the placement of the magnet. The line on the magnet needs to be parallel with the line on the power meter housing. In other words perpendicular on the hands of a clock/crank-arm. The magnet is not only the zero-point in the rotation, it is also your cadence magnet. All in all there are good instructions available to install Pioneer SGY-PM910HL Dura Ace 9000 Single Leg Power Meter. Because I wanted to make use of the pedaling efficiency and rich power data I purchased the Pioneer SGX-CA500 Cycle Computer. This is the brain and heart of the Pioneer Pedaling Monitor System. The Pioneer SGX-CA500 is also a very compact and lightweight cycling computer with 74 grams. It takes you a little while to configure the Pioneer SGX-CA500 cycle computer to your needs, but if you are a techie this will be great fun. The Pioneer SGX-CA500 comes with Wi-Fi connectivity which allows me to upload training files wirelessly to Pioneer Cyclo Sphere, Trainingpeaks and Strava with a few clicks on the cycling computer. Furthermore the Wi-Fi module allows wireless firmware upgrades of both Pioneer SGX-CA500 cycling computer and Pioneer SGY-PM910HL power meter. The Pioneer SGX-CA500 is also able to download information from the Pioneer Cyclo Sphere cloud. With Training Assistant you can create training structures on your tablet, and download these on your Pioneer SGX-CA500. Also your FTP and a few other parameters are automatically synched with Cyclo Sphere. Pioneer SGX-CA500 Cycle Computer comes default with a hard plastic bike mount. 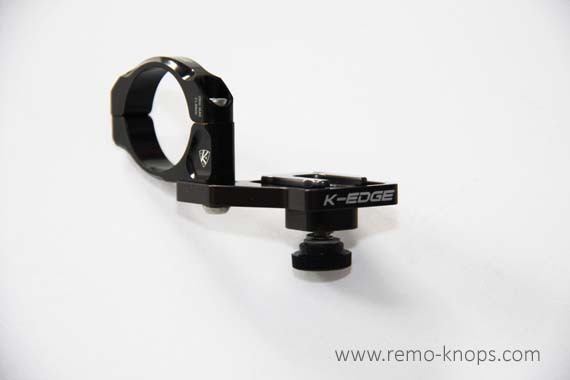 Although this is pretty good, I have been a huge fan of the robust K-Edge mounts. I have used a K-Edge mount for my Garmin Edge 510 for the past years, so I immediately ordered a K-EDGE Handlebar Computer Mount for Pioneer SGX-CA500. The K-EDGE Handlebar Computer Mount for Pioneer SGX-CA500 has a 3 peace design and has a locking system which is best comparable to the flash foot of a professional SLR camera. With a screw, you can lock the Pioneer SGX-CA500 in place, even of rough cobble roads. Unfortunately, the Pioneer SGX-CA500 Cycle Computer doesn’t come with a heart rate sensor. I have used Polar and Garmin heart rate sensors, but decided to go for the Wahoo Tickr-X heart rate sensor. Wahoo Tickr-X heart rate sensor supports both ANT+ protocol as well as Bluetooth. It connects flawlessly with the Pioneer SGX-CA500 but also with my Xiaomi Redmi Note 3. With the Wahoo Fitness app you can also track running and fitness activities. An accelerometer is also build into the Wahoo Tickr-X heart rate sensor, so it could potentially track cadence or number of push-ups. However I don’t use this feature of the Tickr-X. The Wahoo Tickr-X heart rate sensor is very comfortable to wear, even on long bike rides of 5+ hours. If you don’t use the running and fitness features you might want to opt for the normal Wahoo Tickr version, without the X. 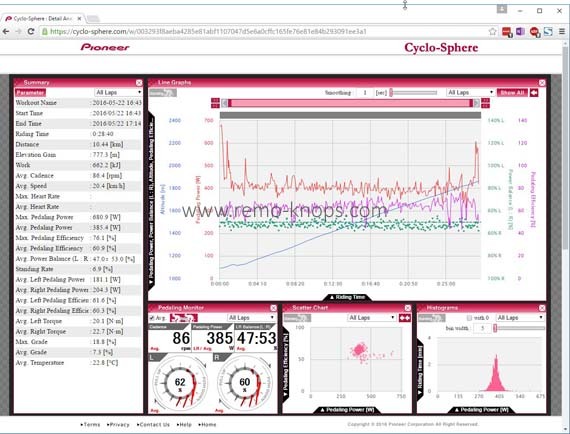 Pioneer Cyclo Sphere is the free analysis software that comes with your Pioneer Pedaling Monitor System. By default I upload my training files over Wi-Fi to Cyclo Sphere that distributes the training files to TrainingPeaks and Strava using the web-link feature. You can customize the graphs and their location, which behave like a sort of widgets. Out-of-the-box and free you get s good set of analysis tools which are sufficient for most cyclist. In my opinion it comes pretty close to the most used feature set of Trainingpeaks. In the latest firmware upgrades of the Pioneer SGX-CA500 also training structures can be created in the mobile/tablet version of Pioneer Cyclo Sphere. Also parameters stored in Cyclo Sphere, like FTP can be synced to the Pioneer SGX-CA500. Here you can see the released Pioneer Cyclo Sphere data of Steven Kruijswijk’s climbing time trail in Giro d’Italia 2016. I’ve been using the Pioneer Pedaling Monitor System (and it’s different components) for a few months now. So far all components are very robust, despite the varying conditions from heavy rain to 25 degree Celsius during 5 hour bike rides with Tourclub Kerkrade. I really enjoy the Wi-Fi capabilities of the Pioneer SGX-CA500. I don’t waste time in uploading training files to multiple analysis platforms. You could even choose to auto-upload your training files. As mentioned in the previous sections, upgrading firmware over Wi-Fi is a robust and flawless process. The power of the Pioneer Pedaling Monitor System is the system of SGX-CA500 Cycle Computer, Power Meter and Cyclo Sphere. For example I can check the battery level of the Pioneer SGY-PM910HL Single Leg Power Meter right from the Pioneer SGX-CA500. And moreover you can gradually build your complete pedaling monitor system starting with a left only power meter and adding the computer and right power meter at a later point in time. The Pioneer Pedaling Monitor System is in my honest opinion one of the best technical power measurement systems on the market. The Pioneer Pedaling Monitor System is the brain child of Ryujiro Fujita, a Pioneer engineer and competitive cyclist. He wasn’t satisfied with the cycling computers and power meters he used during his climbing races up Mt. Fuji and Norikura in Japan and decided to develop his own together with fellow Pioneer engineer Takehiko Shioda. Pioneer PMS was one of the first measured the individual power contribution of each leg. That way Fujita and Shioda could see if a pedaling stroke was in balance. In addition the direction of force applied to the pedals, was measured. With this data, the pedaling efficiency could be measured and training on a perfect pedaling stroke could be started. It is great to read through the Pioneer PMS innovation journey and the corporate entrepreneurship of Fujita and Shioda. Pioneer technology aimed at different market segments (High quality signal transmission technology, precision signal detection, automotive environments, technology that creates a music culture) were used in the development of the Pioneer Pedaling Monitor System. A seemingly un-logical fit of Pioneer and Cycling became very natural. Giant Alpecin and Lotto Jumbo NL are the two important professional teams that ride with a Pioneer Pedaling Monitor System. With stage wins in the Giro d’Italia, Tour de France and La Vuelta in the past years the Pioneer PMS proved to be an important training instrument for these victories. But also the Topsport Vlaanderen, United Health Care (UHC), Rabobank LIV and Team Caja Rural-RGA teams ride Pioneer Pedaling Monitor Systems. Unfortunately I don’t see a lot strategically planned marketing activities, at least here in Europe. Of course there is sufficient activity on the various social media channels, but last year I’ve only seen one promotion to pull customers towards the Pioneer Pedaling Monitor System. It was the Pioneer Power Start action. If you purchased a complete Pioneer Pedaling Monitor System you would get professional advice and coaching from Guido Vroemen, a well established sports doctor with an impressive track-record. The Pioneer Pedaling Monitor Systems has numerous (big) wins in the pro-peleton, but the marketing activities to drive Pioneer adoption in the amateur and cyclo ranks has much room for improvement. I’ll echo, the Pioneer Pedaling Monitor System is in my opinion one of the best power measurement systems on the market. The HD power metrics are unique in the market and the quality of the product over the past 6 months has been excellent. No drop-outs, no false readings and no water-issues with the Pioneer SGY-PM910HL Dura Ace 9000 Single Leg Power Meter. Furthermore it is the only crank-based power meter system that can be upgraded to a dual leg system later on. The Pioneer SGY-PM910HL Dura Ace 9000 Single Leg Power Meter can be connected to every ANT+ capable cycling computer, for example Garmin Edge 520. However the HD power metrics are only available when the Pioneer SGX-CA500 is used. The price-point for Pioneer SGY-PM910HL Dura Ace 9000 Single Leg Power Meter is on par with the Stages Dura Ace 9000 power meter. The price point for the Pioneer SGX-CA500 cycling computer is in the same range of Garmin’s most popular models. The biggest advantage in price is that you can gradually build your dual leg pedaling monitor system (stretching your investment and starting with a single leg system first). Finally a great many thanks to Alex Wauben from Ultrabikes for the excellent advise and service. So if you would like to start with power meter based training, get your Pioneer Pedaling Monitor system over in the Ultrabikes Pioneer PMS webshop. Hey!, I found this information for you: "Pioneer Pedaling Monitor System review". Here is the website link: https://www.remo-knops.com/5281/pioneer-pedaling-monitor-system-review/. Thank you.